"A team of Australian palaeontologists say they have found the fossilised remains of a...'demon duck of doom'". (Reuters)"
C'mon. You don't need to go 40,000 years back in time to find a Demon Duck of Doom. You can catch, behead, and pluck your very own Demon Duck at the nearest duckpond. That comical waddling isn't fooling me. Not anymore. Oh no, I've learnt my lesson. Innocent child that I was, I believed in the propoganda fed to me. Squeaky rubber duckies, ducky stuffed toys, and an endless stream of cartoon ducks. 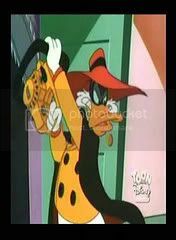 All of which led me to believe that the most I had to fear from our web-footed "friends" was an impromptu shower from friends trying to imitate Daffy Duck. Growing up on the likes of Disney and Darkwing Duck, it was inevitable that the only souvenir I chose to take home from Disneyland was a Donald Duck cap, complete with a duck bill...bill. Foolish times. Of course, this misguided affection could not last. My parents, fed up with the hysteric fits over roast duck dinners, decided that I needed to learn the ugly truth. They brought me to a duckpond. Picture in your mind a young, carefree child (cute as a button, needless to say). Her face lighting up with joy as she catches sight of feathery bottoms upturned. She wriggles out of her father's arms and runs to get a closer look, bread slices falling from the bag in her exuberance. At first, the ducks are considerably unimpressed with the repeated shrill cries of "HULLO DUCKIES!" But after a well-aimed hunk of stale bread clunks one in the head, they realise that "HULLO DUCKIES!" is in fact a feeding call. And as one, they rush to answer it. "Mummy, they like me! They lik-AAAAAAAAAAAAAAAAAAAHHHHHHHHHHHHHH!!!" The child's initial joy at finally being acknowledged by her feathery friends-to-be turns into terror as the whole flock charges at her. Her parents watch grimly from the sidelines, they know that the lesson is necessary. She runs along the bank towards her father but the ducks cut off her escape. In the unholy din of quacking, she panics and backs away. Sensing victory, a seasoned tactician waddles quickly behind the child and neatly trips her...into the pond. The mother starts forward, but her husband holds her back. "It's a shallow pond," he comforts her. True, the water only comes up to the child's neck. But the mother is not worried about the depth of the pond. No, she is concerned about the hungry swan paddling towards her daughter with cold intent. Unaware of the danger behind her, the child is too busy fending off flapping ducks to scramble to safety. The swan, having already acquired a taste for toddler flesh after one too many duck-engineered 'accidents', goes for a sample. The child screams as her hair is yanked sharply from behind and the sudden pain lends her the courage to flail her way past the henchducks to solid ground. But her ordeal is not over yet. The swan follows her and continues snapping at her hair, trying to pull her back. The ducks continue to peck at her ankles in the hope that she will give up and allow herself to be eaten without anymore unnecessary fuss. Finally, she is rescued. Her parents are convinced that she now knows the evil ways of waterfowl and so, she need suffer no longer. It was painful, but the children must be taught. When they arrive home, the child gathers all her duck-related possessions to be burnt. It was a lesson well learnt. And so, the next time you spot a duckling, do not hesitate. Stomp on it, drop-elbow on it, chuck a bowling ball at it, do anything as long as you KILL it! Or that unassuming ball of yellow fluff will grow up to be a Demon Duck of Doom. The creators of Negaduck had the right idea. In other news, this blog can now be reached at http://thezebra.nutang.com. While the older url (http://www.nutang.com/members.php?user=theZEBRA) still works, the new one's much shorter, rememberable, and easier on the fingers. Yes, now you too can have fat fingers like me! secrets that were just for the both of us. But why are you growing old on the inside too?